We met with Adam from D'Addario at the Big House In The Country 2017 event. 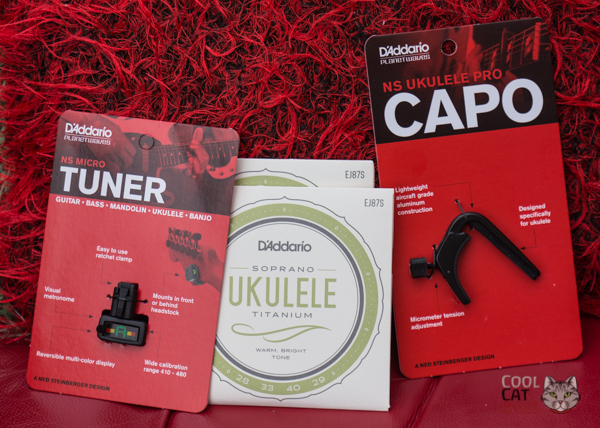 Adam spent some time with us to explain the differences between their ukulele strings and explain a couple of their other products. It was very noisy, we met behind the sales area where there was much ukulele testing going on, but bear with us! We've got some give aways (see picture) for UK fans, we'll run a little share and comment promotion to win these items on Facebook. Loads more information on their strings and other things is available at their web site. Simon loves the little micro tuners. If he leaves one loose, they whizz around the floor, too.